A bug making impossible to install a XAR extension containing an attachment has been found in this version and is fixed in 4.1.1. A regression when diffing document history was found in 4.1 and 4.1.1 and is fixed in 4.1.2. We thus recommend to not install this version and use 4.1.2 or later instead. We've found an important issue in this release with our automatic data migration when upgrading from a version earlier than 4.0. Specifically the migration may fail when migrating wikis having stats, see XWIKI-7976 and when migrating DBs that was migrated from MySQL MyISAM previously, see XWIKI-7985. In addition we've also realized that the migration process can be slow on large XWiki databases and we have speed up the process. All these issue are fixed in release 4.1.3. This is the second release of the 4.x cycle (Roadmap). This release brings Extension Manager improvements such as merging of configuration documents during extension upgrade, a more gentle learning curve by hiding internal documents from non-technical users, and lots of goodies for the developers such as easy sharing of variables between scripts in different languages. Here are notable new features and improvements. For the full list of issues (including statistics) see the JIRA Dashboard. The speed and reliability of the Extension Repository has been improved considerably. For example the XWiki.org Extension Repository is now much faster when you access it from XWiki Enterprise and you should now be able to browse and install extensions in no time. Upgrading applications with related configuration documents is now handled using the merge conflict resolution UI. Changes are displayed as if you were comparing versions from a document's history. If extension installation fails, the error message is extracted from the logs and displayed. You can view the full stack trace by clicking on the error message. The install and uninstall plans display extensions like in the dependency section. This way you can follow the link of an extension to find out more about what is going to be installed. The install and uninstall process is now completely asynchronous. You can see below how the progress is indicated. See the Extension Manager Application documentation for more details. Users who do not opt to see hidden documents do not see them on panels or in search results. If the user doesn't set explicitly the Hidden setting value in his profile, he won't see hidden documents by default. Thus seeing hidden documents is an explicit choice. 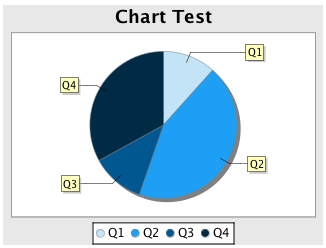 We've added 2 new types of charts, bar3D and line3D, which draw 3D charts. Whereas the Activity Stream allows users to send a message as well as observing messages and activities of other users, this macro allows the explicit message sending functionality to be duplicated in other places without including the activity stream as well. XWiki Enterprise is now available in the Danish language. Wiki administrators can now use a specific timezone regardless of the clock configuration on the wiki server. The following setting can be found under Administration > Localization. Users will find the same setting, allowing them to see dates reflecting their current location. The user setting is accessible through Profile > Preferences > Localization Preferences. New rendering Compatibility Test Suite to make testing easier and simplify implementation of new syntax Parsers and Renderers. You can checkout the Compatibility report for all the syntaxes that are supported out of the box by XWiki. New diff/merge module has been added to make easier to deal with diff and merge both from component and scripts. See Diff module for details. It's now much easier to share variable between languages. You can now create a variable in a Groovy script and use it in a Velocity script. With the new Component Access Script Service privileged scripts can now easily load components from the Component Manager (XWiki's dependency injection system). This is not available in Velocity because of it's limited capability to load classes. With the new Velocity uberspector, Velocity will convert method arguments in string form to formal parameter types when the passed arguments don't match the method signature. But this is not limited to enums. The conversion is done using the Properties Module which means you can create and register custom converters for data types specific to your application domain. Since traditionally, Groovy scripts can enter into unstoppable infinite loops, use reflection to violate security assumptions, access server resources, or even crash the virtual machine, they have been off limits to non-administrators. In a bid to open up new scripting options to less permitted users (especially in wiki farms where getting Programming Rights is a problem since it means having those rights on the whole farm), steps have been taken to make Groovy safer. Groovy scripts are now technically allowed to users having simple Edit rights but the Groovy Sandbox is currently very restrictive (said differently, you cannot do anything useful with it at the moment! ). Now that we have the mechanism in place our plan is to slowly open up allowed operations. To enable and test this feature read the document for both the Commons Groovy Module and the Platform Groovy Module. Filenames of entries in XAR files are now always decoded using UTF-8 during import. The previous behavior was to use the platform encoding. The filenames have always been encoded using UTF-8 in XAR files, but now also the Unicode extra fields are included, so unpacking XAR files with InfoZIP will result in the filenames beeing properly reencoded with the local filesystems character set. Temporary files are now placed in a special sub-directory of the normal temporary directory, this sub-directory called "xwiki-temp" is deleted after each startup of the xwiki system so it is critical that nothing else it placed in it. This improvement means that temporary files such as cached attachments will be removed even if the JVM crashes. Fixed wrong calculation of IDs for stats values making it impossible to upgrade a wiki to version 4.0 if statistics collection is enabled. Faster first startup time by not running a database migration when it is not needed. Simplify reverse proxy setup by making all HTTP redirects use relitive URLs. Was impossible to delete then recreate a subwiki with the same name, fixed. Trying to change a document's parent from the REST service resulted in an error, fixed. It is now possible for non-administrators to execute cross-wiki XWQL queries. Plain syntax and Event syntax have been moved out of Rendering API nto their own modules. See the full list of JIRA issues fixed in the 4.1 release cycle. Prior to Restlet 2.0.14, there was a REST bug allowing arbitrary filesystem read access for registered users. If you're running in a multiwiki setup you'll also need to define the property xwiki.store.migration.databases in your xwiki.cfg file if you want to explicitly name some databases to be migrated as the default is now to migrate all databases. Database that are not migrated could not be accessed.